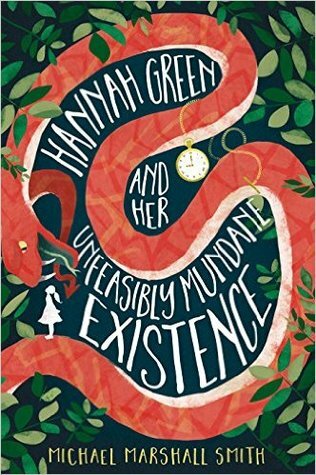 Hannah Green and Her Unfeasibly Mundane Existence is a new standalone novel from Michael Marshall Smith. It’s something of a coming-of-age tale, as the young Hannah Green travels with her Grandfather and the Devil (yes, the actual Devil) in an effort to hold the seams of reality together, and help her parents work out their relationship. Hannah is the young girl whose existence is apparently so mundane. She lives in a world of routine – of trips to other parts of the state, in the back of the car whilst her parents talk. Of school – lessons, bells, and so on. It’s a universe of certainty, where each day holds close to something of the previous. That routine is shattered when Hannah’s parents decide to stop living together. Smith manages to give Hannah a unique, persuasive voice. She’s only eleven, and so lacks some of the context that an older reader may get, as her parents relationship gently fails. But she’s bright, inquisitive, and not afraid to ask questions – and if there’s an innocence there, it never grates. There’s some great characters floating through this text, but Hannah is probably the most challenging, and the most convincing – a girl thrown into situations she doesn’t entirely understand, determined to make the best of them, to be treated as if her opinions matter, and do the right thing. Where Hannah is a gentle and amusing protagonist, her parents are something else entirely. Smith paints a picture of a relationship which isn’t in crisis, per se, but in slow decline. There’s an energy to it, a sense of individuals struggling to define their emotional connection to each other – or redefine it. If Hannah’s character is one of the highlights of the text, this relationship – febrile, built on memories and now in flux – is another. The silences, the justifications, the sense of drifting further apart, of quietly needing different things, is well-crafted and feels genuine. Then, of course, there’s the Devil. He is, perhaps unsurprisingly, not a nice person. Still, as Hannah and her family have layers, so does this personification of malice, whose efforts to work out why he’s no longer as powerful as he should be are entangled with Hannah and her family. The Devil’s straightforward, politely expressed spite is a gem – each appearance mixes polished banter with an aura of lethality. The Devil is joined by an “Accident Imp”, also described as a talking mushroom, which attaches to people and gets them into, well, accidents. As a foil to the Devil’s polish, the imp is a gem – avuncular, chatty, aware of its low status in the Devil’s er…organisation – and prone to mishaps of its own. There’s a warm comic timing between the two, and the imp’s interactions with other people are equal parts hilarious and charming, inhabitant of Hell though he is. Along with Hannah’s grandfather, a man with a penchant for machinery and mystery, this motley collective make up a thoroughly enjoyable cast. The frustration and emotional devastation of Hannah’s parents is palpable and real, at least as much as the whimsy and determination of Hannah herself, the Devil’s temper and penchant for overwhelming force, or the accident imp’s surprisingly insightful banter. That they operate, mostly, in the real world is helpful – the vistas of Nothern California are lovingly described when required, and the small town life which Hannah leads really does seem to come alive as one meanders through it alongside the story. From a multiplicity of coffee shops and forests, through to the environs of Hannah’s home, each environment feels both strange and familiar, coming off the page with vivacity and verve. The plot – well, no spoilers, but I think it works rather well. Hannah’s journey is one which encompasses both an effort to save the world, and one to understand her family. Both these threads are fascinating in their own right, and where they wend and intersect with each other, it becomes impossible to stop turning pages. This is a story of a journey, and of a family, as much as it is one of demons, ancient pacts and talkative mushrooms. I’d have to say that these, and the sheer imagination deployed, make this book one that is very much worth picking up.